A look at the Indian Pricess Head Dollar designed by James Longacre. 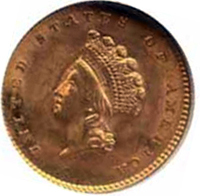 A Type 2 Gold Indian Princess Head Dollar, dated 1854. Small head graded MS64. Over 8000 graded but only around 100 graded higher than the example below. A similar graded coin sold for $20,700 at Heritage Auctions in December 2009. In 1854 the US Mint issued the redesigned gold dollar with an increased diameter of 15 mm, neither its weight nor its composition was changed. James Longacre designed a new obverse for the coin based on his work with the three-dollar piece. The head depicted on the obverse has commonly been described as an Indian Princess, which gave this type of dollar its name. However, historians have suggested that the design is actually based on a Roman marble figure, to which a head-dress was added by Longacre. More specifically, it has been suggested that he based the design on Crouching Venus, a statue on display in the Philadelphia Museum of Art. In addition to the obverse, the reverse of the gold dollar was also modified somewhat, and the inscription UNITED STATES OF AMERICA was moved to the obverse. The overall wreath design remained unchanged. In the few production years of the Indian Princess Head Dollar, only six date mint mark combinations were created: 1854, 1855, 1855C, 1855D, 1855O, and 1856S. 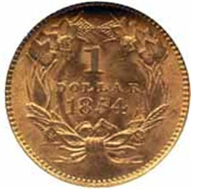 Although the diameter of the gold dollar had been considerably improved, the new Indian Head dollar was not free from problems. The height of the relief was such that very few of the coins produced were fully struck, and as a result the design was not sturdy enough for circulation.